Here’s a quick story from HubSpot about a small music business and how they used blogging to increase sales. Please check out the rest of the post and most importantly the entire slideshow. It’s not too long, but is worth your time. HubSpot is leading the way on what they call Inbound Marketing. Their clients use HubSpot’s software to implement inbound marketing strategies aimed at getting found on the internet. It’s a pull marketing strategy as opposed to the traditional push marketing. 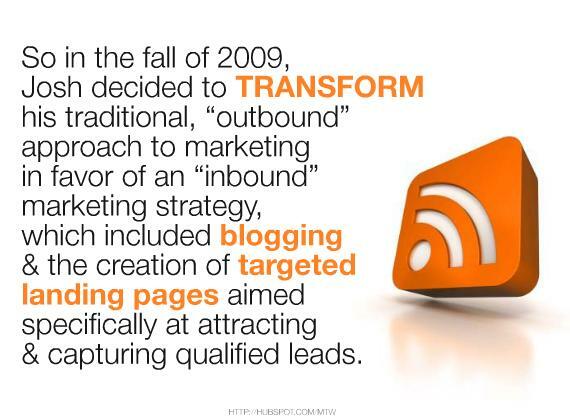 Blogging is an essential way to generate the content necessary to implement an inbound marketing strategy. Businesses are starting to utilize blogs as a way to increase traffic to their site. Beyond just getting more traffic these businesses are creating content aimed at driving qualified traffic with the ultimate expected result to be a sale. With Jammin’ With You, the company was able to successful move from the traditional forms of marketing and adopt the inbound method and the reward is showing it was worth the risk to change and be different than others in their industry. The music industry is notoriously behind the curve regarding marketing strategy. Jammin’ With You Specializes in selling music lessons, but music artists would seem to benefit more from ditching the traditional push marketing of big record labels and opt into inbound strategies to coincide with the songs and music they create. Examples like Jammin’ With You should keep coming. What is your business doing to join in the success?